As I look back to my journey with DRIME, I can see that God has been directing me back to this ministry again and again. I am grateful that He is in control and was giving me guidance along the way! I first learned about DRIME in my youth group in Vancouver, when our leaders showed us some DRIME dramas on Youtube and we tried learning some of them. I was immediately attracted, as I’d liked dancing since I was young and I had always wanted to use my talent to serve God, but I never knew that such a dance/drama evangelism tool existed. I wanted to check out the Vancouver team, but I learned that I was too young to join, since the people on the team were university students and older. I didn’t think about DRIME again, until a coincidence a few years later. 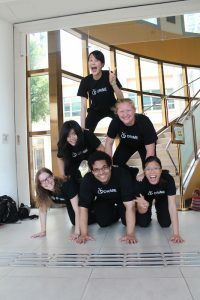 I was studying in Hong Kong for my undergraduate degree, and after my first year of studies, I wanted a mission trip experience to try out evangelism. While looking at different opportunities that my youth leader sent out, I came across a DRIME mission trip to Hong Kong in August 2014. I was delighted to find an opportunity where I did not need to travel too far, and DRIME had been something I wanted to try for a long time. I signed up, passed the interview, raised my trip expenses, and went on my first mission trip. Although it was only two weeks, the intense training and outreach on the mission trip increased my knowledge about DRIME and drama evangelism significantly. I used to be scared to talk to strangers randomly, and the idea of talking about Christ abruptly seemed odd to me. However, God used DRIME to boost my confidence in sharing the gospel. As people were drawn in by the dramas, I was able to approach them naturally, and slowly the conversations began to flow and I was constantly looking for people to chat with. I began to enjoy the conversations – listening to people’s stories, what they thought about God, or just things happening in their lives that I got to pray for. Since the people on the street vary from young children to the elderly, every conversation is very distinct, and that is something that I treasure to this day. I also really enjoyed doing the dramas on the street, where it feels like public worship, lifting the dramas to God, for Him to use to touch the hearts of those who are watching. Every street outreach was refreshing to me and I was constantly amazed at what God is doing through this ministry. 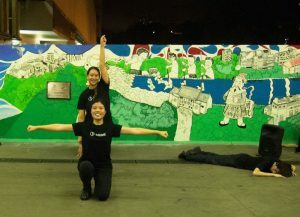 After the trip, I joined the DRIME Hong Kong team and continued doing ministry with them weekly. At the beginning of my final year in university, I prayed to God that He would lead me in the direction He wanted me to walk in. I asked Him to close all doors except the one that He wanted me to go through. I remember this prayer clearly because I was quite certain of His direction in the end. Over winter break, I went on a mission trip to a closed country and I was reminded of my desire to be “in God’s house” every day, worshipping and serving Him. It made me realize that I was interested in full-time ministry, not just doing it alongside a “regular job”. I decided to start with a one-year experience to test it out. Initially, I wanted to apply for a program where I would spend a year overseas doing short-term missionary work. But my mother was strongly opposed to it and pleaded with me to return home after university. I was able to hear her reasoning, and as family is our first calling in life, I respected her opposition and decided to join a ministry in Vancouverinstead. I passed the application process in June, and my expectation was to start working by September. In between the months, I had to raise my own funds to ministry, and once again it was a test of my faith in God to provide all my needs. I experienced a time of doubt as some friends dismissed my intentions in ministry, but God encouraged me. Through the fundraising process, I became more certain in His calling, as I reflected on how I desired to make ministry my “official work” and supporters expressed their encouragement to me. So here I am working in the DRIME office as an intern, and in Vancouver learning about the needs in my family and community! I am grateful that God is using this ministry to continue molding me. As an intern I am able to help out in different projects, which enables me to grasp the bigger picture of how the ministry functions as a whole. 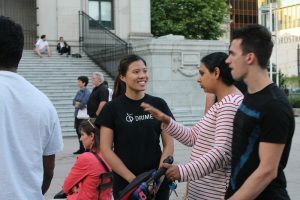 God is also providing me with exposure to the people on the streets of Vancouver as I serve with DRIME Vancouver, embracing myself once again in the multicultural environment, only this time with a new gospel lens applied. I am eager to learn what God has prepared for me in the future ahead, to figure out the reason for this cultural exposure, and to continue walking in the path prepared by Him! Interested in our internship program? Click here to learn more!